DIY Transmission Flush. Lo-cost, Easy Way to Clean Out, Smooth Out Rough Shift Trouble. DIY Transmission Flush Contact Info: On a smartphone, to ask a question, order this product, Call me...george at 512 665 3388. Mega Power Gets Raves for its New DIY Transmission Flush Treatment. Transmission shift trouble is a worrisome problem. Here's several ways to end them, including our favorite from Mega Power. For the first time, any man or women vehicle owner can end their automatic transmission rough shifting, slip, chatter problems - themselves with Mega Power's DIY Transmission Treatment. Replacing 50 year old DIY Transmission flushes and expensive repairs. The repair shop may tell you it cost Over $2000 to $4000 to fix your rough shift. they may show you metal filings worn of gear parts in the transmission pan as evidence of needed repair. However, that seldom is true as all transmissions collect such , and its not the reason for your trouble. Dirty residues and wear roughen surfaces are the cause. Traditional engine, solvent cleaning and flush products, relabeled for transmission usage, sold in parts stores and quick lubes have not changed much in 50 years. Mega Power's DIY Transmission Problem Solver Ends Rough Shift. Avoids repair need to do so. Danger: Danger can occur in today's engines and transmissions as solvents clean too well! Part store flush additives strip off the lube film on gears and shift parts and pistons, during their flush period creating raw metal-to-metal friction. That the problem with part store DIY Transmissions flushes. Mega Power's DIY Transmission Flush Advantages. Do not contain solvents, but use chemical cleaners that offer added lubrication features as they clean as a protection. Mega Power cleaning is problem specific. Its ingredients clean, free, smooth and condition which end your dirty, worn, shift conditions. Smooth shift results are immediate and permanent for you. Is that what you are after? Mega Power is a transmission service product and a rough shift, slip, problem solver. Made to service new transmissions every 4 years. Made stronger to correct problems. Mega Power invented several cleaning chemicals and paired them up with sludge holding ability and lubrication features to end rough shift.Mega Power ends the trouble some flush additives can't! The second problem flush additives have is they strip engine or transmission of sludge. If drained right out, OK. If you wait a few minutes tool long, the sludge drops out. This often blocks oil delivery. The second problem Mega Power overcomes with anti flocculants. Sludge and varnish removes become liquefied and won't resettle until the fluid is changed - usually a week later. 10 minutes to a week of driving is the cleaning period. There are 2 other ingredients in Mega Power to end rough shift. Mega Power DIY Transmission Flush item cost. 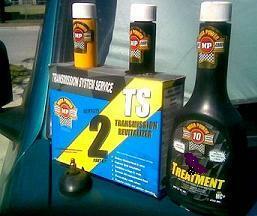 The Mega Power cleaners and anti flocculants are included in the the MP Transmission Cleaner TS1 $49. MC+ Transmission Fluid Conditioner TS2 $49 add smooth shifting benefits and anti-wear, and exceed Mercedes Benz requirement as a fluid anti wear. It contains a shift smoothness enhancer. And Seal Stop Leak. Mega Power Friction Modifier TS3 $49. Provides lube and surface protection not allowing metal migration - the worst kind of rough shift to overcome. its needed to end jerk, slippage, even the clunk at 45 mph converter lockup. Included is our Co-Polymer coating to fill worn spaces. A second feature for slamming the brakes on rapid wear out. 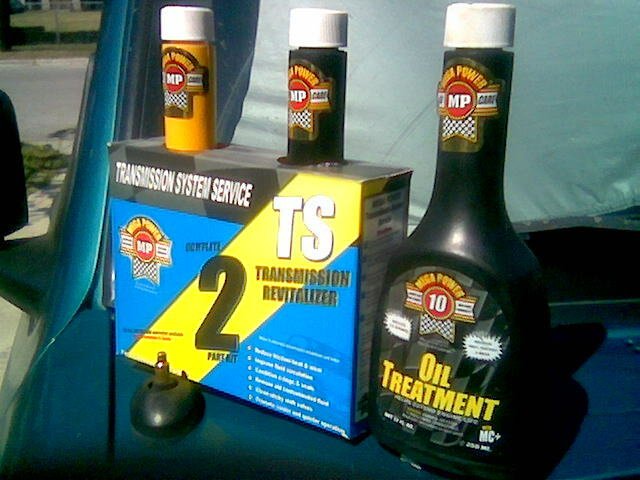 The 3 items are packaged as a service treatment to correct transmission performance problems. Directions: Add, drive. Then replace fluid a week later. Driving does the fix. Simple. Results guaranteed! Order these Mega Power's DIY Transmission Service items. as your transmission problem solver in a few days to install. Comes with 3 items needed, direction to install, phone help, guarantee. Order Now! Today's Bonus: Free. Engine Protector Treatment, a $49 value - until 100 are gone. Makes this car worry end, too! Protect engine and transmission! Just $75 plus $15 s&h + tax 7 = $97 total. Why add an "anti-wear cleaner" to a flush product. For over 50 years both engine and automatic transmission flush additives have contained a solvent, something like lacquer thinner to loosen and flush out engine and transmission sludge. dry the idea started in the 30's back then for the mechanic to remove sludge before dismantling the transmission - or engine, just for overhaul. Sludge caused the repair need. While it was known that solvent based flush additives strip the residues off the gears, bearings, valves, and such, they also strip the oil film off those moving parts - creating a lot of dry metal-to-metal friction during the short time the flush cleaner remained in the transmission. That dry surface increases friction as pistons and bearings and gears rubbed but who cared, since new parts were to replace those worn ones. The additional damage mattered little. Soon mechanics dropped the pre-flush idea for those harmful side effects. To increase sale of flushes, the product makers relabeled the flush as a 5 minute rinse. Parts stores and quick lubes now had a new way to profit off a dying money maker. Stay away from solvent flush additives! Every transmission flush additive sold in part stores and quick lubes have a strong warning on the label that the car not be driven. Can you guess why? But not Mega Power's DIY Transmission Flush! A New DIY Transmission Flush Treatment is ending automatic transmission rough shifting, slip, chatter problems, helping vehicle owner avoid damage they can cause, and its costly to repair headache. Traditional solvent cleaning and flush products sold in parts stores and quick lubes have not changed much in 50 years. But, today's engines and transmissions can't take the solvents in them without some damage occurring, from their clean/dry oil-less surfaces that must say lubed. That is quite the opposite of Mega Power's method and their Mega Power Transmission Service Product. Mega Power, an additive research and ingredient formulator tested and selected 3 new non-harming cleaners. These make up the transmission treatment we promote to service the fluid change, an also end rough shift problems. Containing conditioning features for your transmission problem solving benefits. Sold only online for individuals and mechanics to order. Mega Power discovered several cleaning chemicals and paired them up with sludge holding ability.This solves the second problem flush additives. The second problem flush additives have is they strip engine or transmission of sludge. If drained right out, OK. If you wait a minute tool long, the sludge drops out. This often blocks oil delivery. The second problem Mega Power overcomes with anti flocculants. MC+ Transmission Fluid Conditioner TS2 $49 add smooth shifting benefits and anti-wear and exceed Mercedes Benz requirement as a fluid anti wear and shift smoothness enhancer. Leak stoppage occurs with these two ingredients. Mega Power Friction Modifier TS3 $49 provides lube and surface protection not allowing metal migration -the worst kind of rough shift producers. An aid to ending jerk, slippage, clunk at 45 mph converter lockup. Order HERE! Have these 3 Mega Power items as your transmission problem solver in a few days to install. Comes with 3 items needed, direction to install, phone help, guarantee. Today's Bonus: Free. Engine Treatment $49 value - until 100 are gone. Just $75 plus $15 s&h + tax 7 = $97 total. You can see Mega Power's DIY transmission flush does more than flush. It ends transmission performance problems. Order if you have such! Directions are easy. 1- Add T1 to the fluid and drive as you do for a week. 2- Change that fluid and to the new fluid ad T3 and T3. That corrects those negative issues wear causes. Towing vehicles who install Mega Power will notice their transmission housing temperature drop up to 40 degrees. A factor to avoid premature failure. The product and temp drop from friction removal turns our to end shift problems, leaks and chatter at 45mph converted lockup. A transmission saving benefit. Transmission repair start at at $2000. Mega Power's fix is about $100, Guaranteed to avoid repair need in 90 out of 100 vehicles for 90 days or longer. Is that the help your car needs?. Shown here. Mega Power also works in power steering systems, hydraulic systems, and new and even worn out motors - revitalizing those components for years more dependable service. Mega Power uses a simple Do-it-yourself DIY transmission flush procedure which is easy for anyone to do to end wear and residue problems and extend the life of their transmission. The Mega Power DIY Transmission Flush is a 3 item Treatment. You add the cleaner to the ATF Fluid dip stick tube to send the cleaner with MC+ into the dirty fluid. With the motor running, move the gear selector into and out of all the gear and part positions. Then drain the fluid out as directed. You can install the Mega Power flush cleaner, then drive to your quick lube to have them replace the dirty fluid. On top of the new fluid the remaining two products are added. Drive as usual. Smooth improvement that will last for years is always noticeable immediately - guaranteed!